If you are just joining with this article, not that in the previous article of this series, Implementing a manual SQL Server Audit, we went through the different methods that can be used to audit various types of actions performed at both the SQL Server instance and database levels. The SQL Trace feature was introduced the first time in SQL Server 2000, and considered as the best method of SQL Server auditing using different SQL Server actions. At the beginning, you need to define the classes of events that you manage to collect using a set of T-SQL system stored procedures. The defined events can be collected using the SQL Server Profiler tool, which cannot be used in the production environment due to performance purposes, or simply called inside your application to create these event traces manually. These system T-SQL stored procedures include the sp_trace_create that is used to define the SQL Trace, sp_trace_setevent that is used to define the list of event traces to be collected and the columns that is retrieved, and the sp_trace_setstatus that can be used to start, stop and remove the SQL traces. SQL Traces are working temporarily, where the traces will be stopped, and not started automatically, when the SQL Server service is restarted. For more information about the SQL Trace feature, check out the SQL Trace document. Both the SQL Trace feature and the SQL Server Profiler tool are deprecated and may be removed from future SQL Server versions, as the technology is replaced by the SQL Server Extended Events feature, that we will describe shortly in this article. SQL Server Extended Events feature was introduced the first time in SQL Server 2008, as a light weight performance monitoring feature. 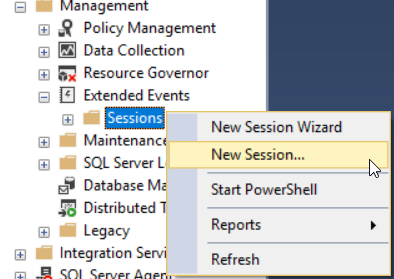 And with the vital enhancements in SQL Server 2012, such as the SQL Server Extended Events graphical user interface that makes it easy to create and configure the Extended Events sessions without the need to go through the underlying architecture of its framework, it is considered as the best replacement for both the SQL Server Profiler and SQL Trace deprecated features. SQL Server Extended Events are a highly scalable and configurable events framework that helps in collecting as much useful information as possible from the wide range of available actions, with the least possible SQL Server resources consumption, for troubleshooting and performance tuning purposes. For more information about the SQL Server Extended Events feature, check the Extended Events article. SQL Server Extended Events cannot be used to design a complete database auditing solution. Although it is very useful in auditing the successful and failed logins processes, as shown in the previous example, this feature still limited in terms of auditing the different database DML changes and comparing the values before and after the modification process, that can be easily performed in the SQL Server auditing mechanisms discussed later in this article and the next articles of this series. SQL Server triggers are special type of procedures that are automatically fired when an event occurs at the SQL Server database. There are two types of triggers, the DML triggers that are executed as a result of a data modification or insertion operation. The DDL trigger is executed as a response to a data definition operation, such as CREATE, ALTER or DROP statement. The response of the trigger to the different actions can be in the form of another statement that will be executed after the current action, or a statement that will be executed instead of the firing action. For more information about the SQL Server triggers, check the CREATE TRIGGER article. SQL Server triggers can be used to track and audit large number of database operations. This is due to the fact that, the triggers are T-SQL scripts that can be customized to build your own SQL Server auditing solution that fits your systems, based on your development skills. You can create at least one trigger on each table that contains critical data to audit the modified or inserted data and compare the data before and after the modification. You can also design a proactive SQL Server auditing system using a trigger that prevents the changes on a specific table and instead of performing that change, it will audit the failed action to a data repository. This is a simple example of how we can take benefits from the triggers in auditing the data and schema changes. And it is yours now to build your customized code based on your development skills for SQL Server audit purposes. Third party tools like ApexSQL Trigger, can help you rapidly design and automatically maintain a trigger-based, SQL Server audit solution. Building an effective SQL Server auditing system using triggers is difficult and will add more complexity to the database design. In addition, It is not recommended to create the SQL Server triggers in a heavily transaction tables, as it will be executed each time a data insertion or modification process is performed, adding extra time and resources overhead to different SQL Server queries and transactions, and leading to a major performance issues on these tables. In the next article, we will discuss a more effective way to create a SQL Server audit by reading SQL Server Transaction Log records. Stay tuned!